This raises a number of issues that need to be discussed. The first point to make is that BREEDPLAN doesn’t breed cattle, cattleman do. I concede however that in the explanation of this technology we (myself included) often focus a lot on growth. The fact is that breeding profitable cattle is a balancing act across many different traits, growth been only one. Note that BREEDPLAN does also have traits for fertility and carcase. The second point is that we need to be careful to distinguish between “bigger cattle” (ie larger frames scores) as compared to “faster growing cattle”. BREEDPLAN measures weight at 200, 400, and 600 days so as to describe particular genetics for different segments of the growth curve. Extremely large framed cattle also often have a late maturity pattern meaning that they continue to grow well after 20 months (600 days) of age. This means that “yes” focusing selection only on high 600 Day Weight EBV’s (Estimated Breeding Value) could lead to bigger cattle – but it doesn’t have too! BREEDPLAN also evaluates a mature weight EBV measured by recording cow weights at the time that their calves are weaned. This combined with the 200, 400, and 600 day growth EBVs allows us to identify genetics with a particular maturity pattern; for example genetics that have superior growth till 600 days and then taper off. Figure one shows example growth curves of two animals with similar 600 day weight but different mature weight. The question that needs to be asked is which animal is more profitable? The answer to this question obviously depends on an individuals breeding objective but considerations should be; the optimal age of turnoff of bullocks, meeting minimum fat specifications, and mature cow feed requirements. If your age of turn off is 24 – 30 months then you would likely be after the animals that have matured prior to this time and thus have achieved “finish”. Table 1: ABBA published sires with the same 600 day weight EBV but significantly different Mature Weight EBV. Note the importance of considering the mature weight EBV as the two sires have 19kg genetic difference for this trait whilst maintaining the same 600 day weight EBV. Looking for sires that encompass these fast growth/moderate mature size genetics I searched the Australian Brahman Breeders (ABBA) database (via their website) for published sires that were +40 for 600 day weight, which places them in the top 20% of the Brahman breed. I then ranked these high growth sires on Mature Weight to identify what variation in mature size was apparent. The EBVs for the highest mature weight EBV bull (Sire A) and the lowest from the group (Sire B) are shown in table one. In practical terms if your optimal age of turn off is 24-30 months, then some growth after 600 days (20 months) is still sought after. 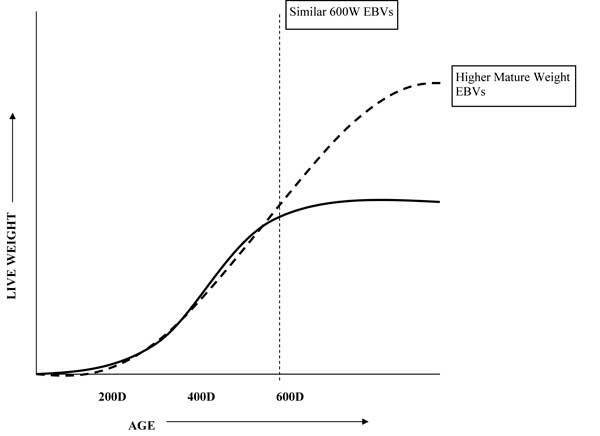 The genetics to be wary of however are those with significantly higher mature weight EBVs compared to their 600 day weight EBV; this indicates a later maturity pattern. In conclusion the importance of a Mature Weight EBV should be clear, as it provides insight into the extended growth pattern of an animal’s genetics. This in turn allows us to distinguish between genetics that grow into “bigger” animals as compared to those that are simply “faster growing”. The problem is that there is a lack of stud BREEDPLAN members recording this trait in northern Australia. If a breeder is already recording weaning weight then it is a relatively simple job to also collect this information.